For 10 years, European Space Agency spacecraft Rosetta has been making wide arcs through the solar system as it uses planets’ gravity to slingshot itself toward its destination. It spent the last three years in hibernation to preserve energy as it traveled too far from the sun to fully power itself on solar energy. Today, the Rosetta will wake up. It’s now close enough to its final destination, the 67P/Churyumov-Gerasimenko comet, that it is time to begin preparing for its main mission: collect data and deliver the Philae lander to the comet’s surface. 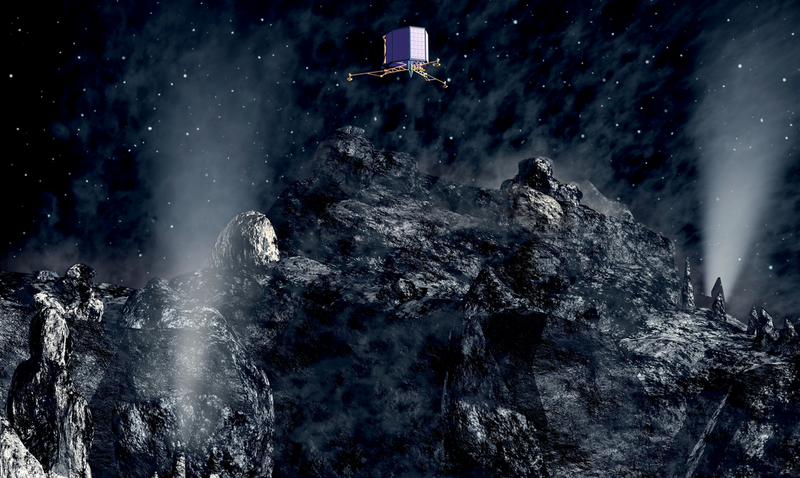 It will be the first spacecraft to orbit a comet and first lander to set down on a comet. Rosetta is expected to arrive at the comet in August and continue to orbit it throughout the mission. Philae will land in November. Philae will anchor itself with a harpoon to prevent itself from floating away due to the comet’s weak gravity. In tandem, Rosetta and Philae will study the composition and structure of the comet, plus its environment and how it reacts as the comet passes closer and farther from the sun. Comets, which are essentially icy rocks, are known to heat up as they approach the sun and emit gasses Philae contains an onboard laboratory that will analyze samples drilled from the comet.